The beautiful North Yorkshire spa town of Harrogate has now been crowned the happiest place to live in Britain for the third year in a row. The annual survey from Rightmove asks people how happy they are with their home and their local community. The report also found that those living in Barking & Dagenham were the least happy with where they lived, and the area was voted as the least safe and well-kept place in Britain. Residents said it provided the worst services and had the worst community vibe and neighbours. Taking second and third place in the standard of living report were Shrewsbury and Ipswich, with the historic towns of York and Chester filling the last 2 spaces in the top 5 table. Inverness was found to be the happiest place to live in Scotland, while Llandrindod Wells took first place in Wales. Richmond was number one in London, and number 19 on the overall list. Rightmove surveyed 24,000 people in 130 different places, and asked them a number of questions about their home, including how proud they were, how nicely decorated it was, how safe they felt, how much space they had, and how nice the neighbours were. "This is fantastic news - to come top two years running was great, but to be named the happiest place for a third time is just amazing." 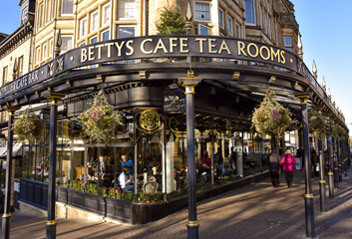 Harrogate famously found itself in the folds of a mystery when novelist Agatha Christie famously disappeared from her Surrey home in 1926 and turned up a few days later in a Harrogate hotel. In terms of other contentment factors, Blackpool came first for space, and Dundee was given the title for best décor. Newport took the top spot for value, while those living in Luton worried most about house prices – this is despite the fact that asking prices have increased by 8.6% in Luton over the past year and have only increased by 1.8% in Newport. Those living in Torquay said they had the most to do in their area, whereas residents of Paisley in Scotland frequently find themselves bored and staying at home. Anyone looking for good neighbours should consider moving to Landrindod Wells, as the survey found that people living there are very polite. Residents of Falkirk said they found the day-to-day costs of running their home the most manageable, whereas those living in Hounslow seemed to struggle the most and found it hardest to cope. The happiness index is a great place for people to go to when they are looking to move house, as they can look through the different factors and see which places around Britain have got the best and worst ratings. Hunters have over 150 independently owned branches nationwide including Yorkshire, London, Welling, and the South East.